Compatible rainbow bundle value pack of Oki C532, C542, MC563, MC573 printer toner cartridges. One (1) each of Compatible Black 46490612, Cyan 46490611, Magenta 46490610 & Yellow 46490609 toner cartridges. 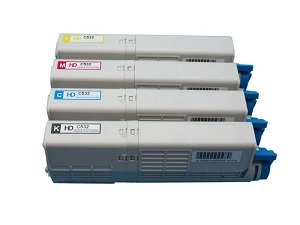 Page Yield of Compatible OKI C532, C542, MC563, MC573 cartridges : Black toner cartridge 7,000 pages. Each colour printer cartridge, Yellow, Magenta & Cyan has a page capacity of 6000 per colour cartridge. Manufactured and print quality guaranteed compatible toner cartridge rainbow value pack for Oki colour laser printer models C532, C532dn, C542, C542dn, MC563, MC563dn, MC573, MC573dn. Compatible replacement high yield Oki laser printer toner cartridges (aka clones or generic) are engineered to meet the highest standards of quality, reliability and exceptional print performance just at a much lower cost per page printing. Manufactured containing 100% new components and tested toner, they are a reasonably priced alternative to costly original Oki supplies, and accordingly offer huge office savings. Our rainbow value pack of Oki compatibles is designed to substitute for the original Oki toner cartridges in colour laser printer models C532, C532dn, C542, C542dn, MC563, MC563dn, MC573, MC573dn. 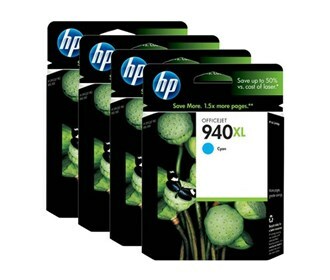 These higher page yield cartridges also means less frequent cartridge changes are required. 100% Manufacturer guarantee of print quality and printer toner cartridge performance. Could your office benefit from cost saving compatible Oki printer cartridges ?